Please excuse us. We’ve been hibernating. But with a spring in our step, an extra hour of daylight, and the last gasp of winter citrus, we thought it was time to update you with a recipe and an idea for a spring time party. My darling friend of 12 (!) 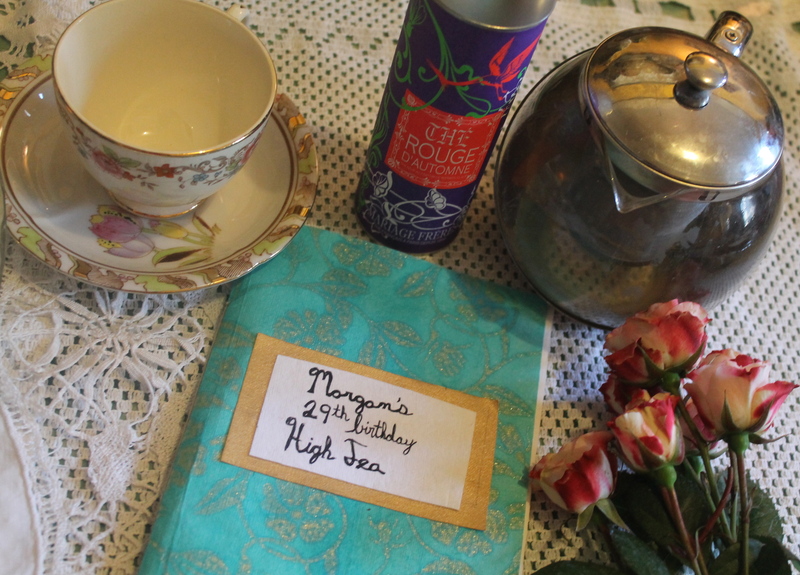 years M. was in town for her 29th birthday and decided she wanted to have a high tea. She invited us to a friends’ apartment, and asked that we bring a tea snack. Since my new favorite thing to do is a custom birthday cake I asked her what she would like and what flavors she enjoyed. The response: Cheesecake, lemon, and plan flavors like rose or thyme. The idea presented itself right there. Why not a lemon cheesecake, infused with thyme, and topped with whipped cream flavored with rose water? In gathering ingredients to make the recipe I realized that I didn’t just have any lemons, I had Meyer lemons. 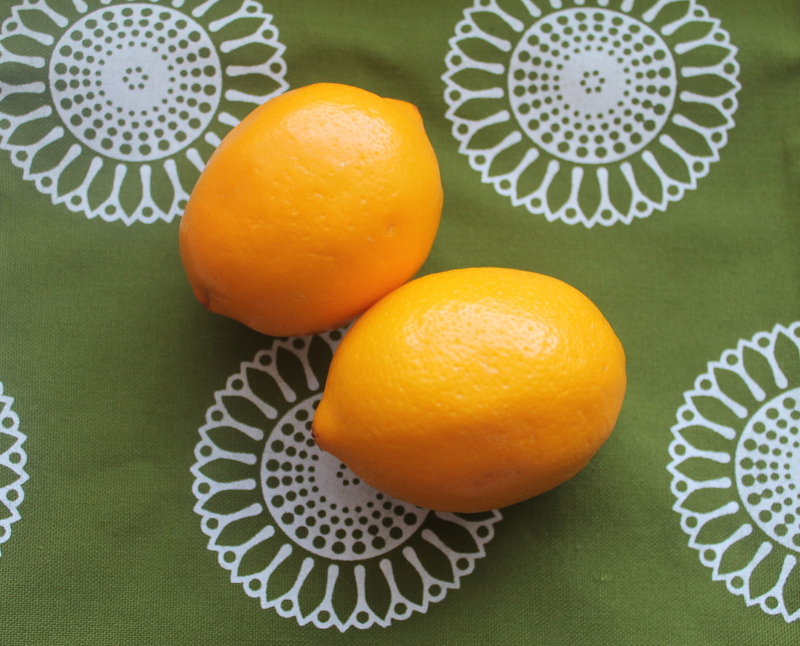 A sweet, lemony cross with an orange they would be perfect in an afternoon tea treat. 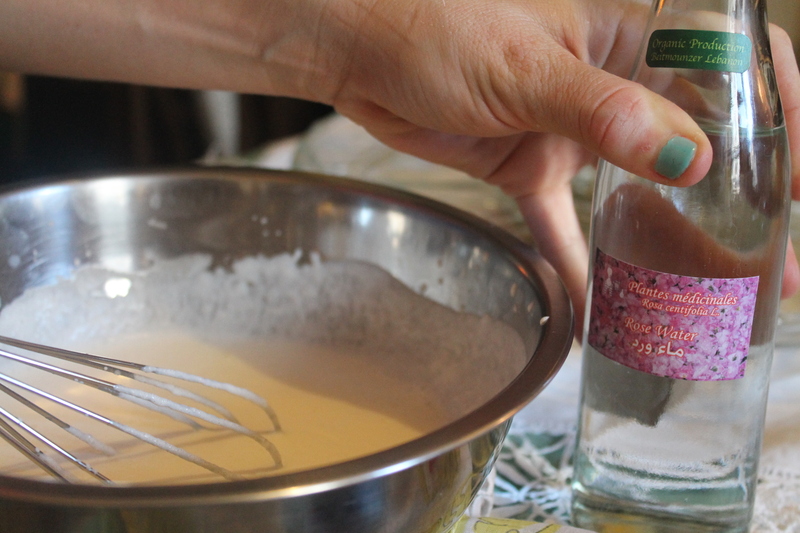 And why not infuse the thyme into the cake? And why make a big cheese cake when I could make personal sized cheese cakes? Less mess, less fuss, and cute on a tea tray. Preheat oven to 350 degrees. In a food processor mix together the graham crackers, salt and sugar. Slowly add the butter until the mixture forms a fine crumb. 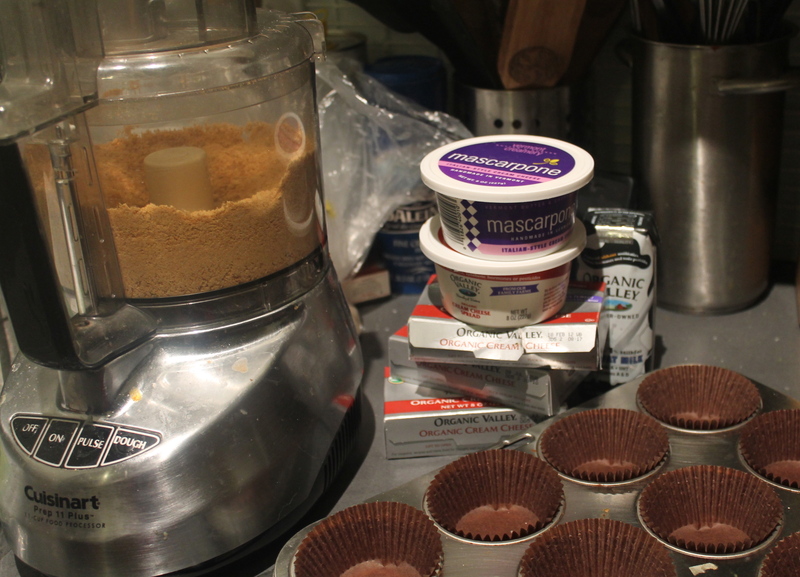 Line a 12-cupcake tin with cupcake liners and then spoon the mixture into the liners. Press with your fingers or the back of the spoon. Bake for 8 minutes and cool before adding the cheesecake filling. Preheat oven to 350 degrees F. In a small saucepan add the milk and thyme sprigs. Warm the milk (do not boil) thoroughly over low to medium heat. Remove from heat and let infuse for 20 minutes. In the food processor or with an electric mixer mix the cream cheese until light and fluffy. Add the sugar, mascarpone cheese, and thyme infused milk and milk until blended. Add the eggs one at a time. Add the lemon juice and zest. 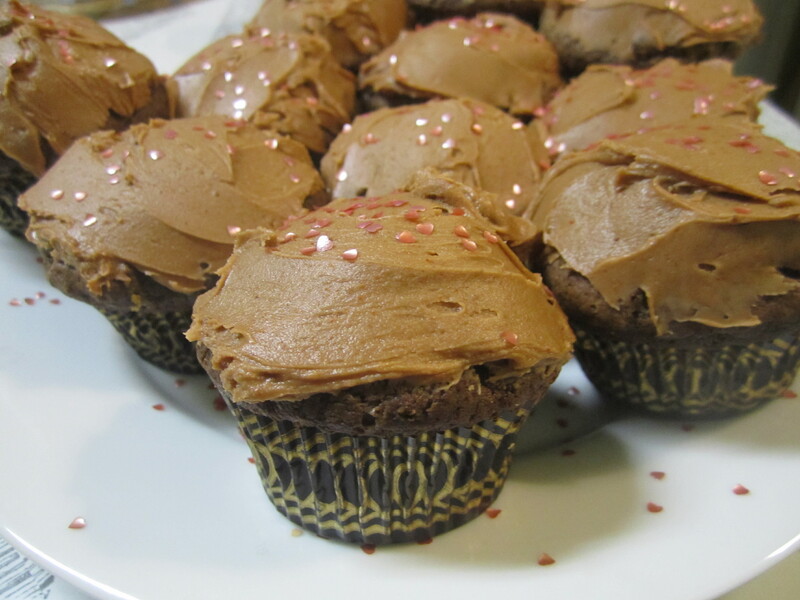 Pour into cupcake tin lined with cupcake wrappers and graham cracker crust. Bake for 50 minutes until the top is golden brown. Remove from oven, cool and let refrigerate for at least six hours before serving. 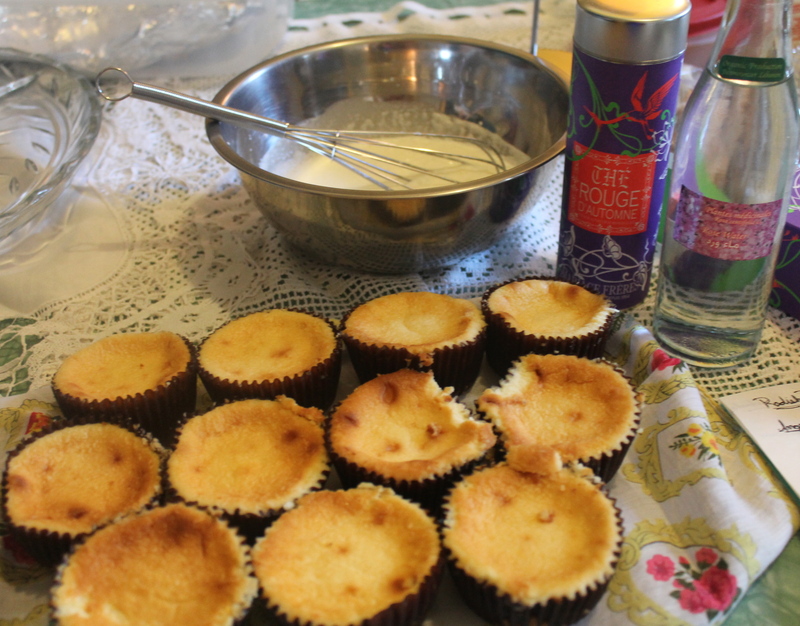 To serve: whip 1/2 cup heavy cream with 3 TBS rose water and top the mini cakes with it. 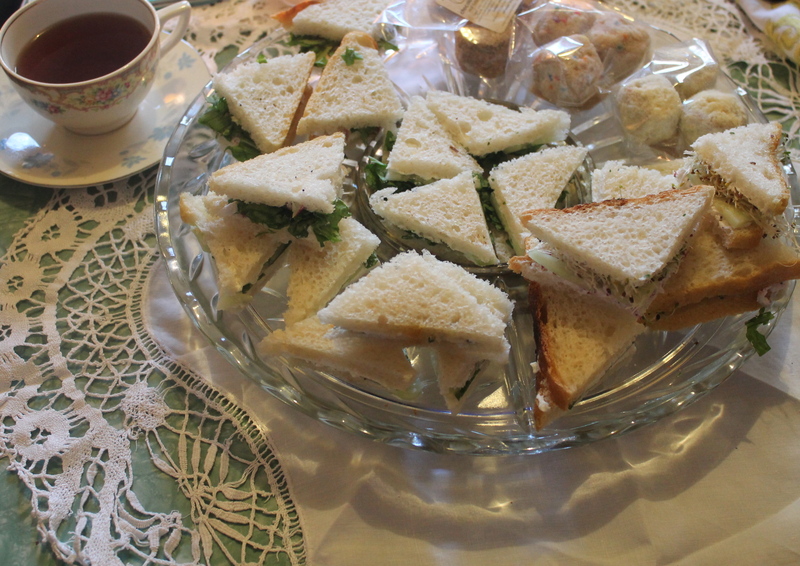 The cakes were an elegant and dainty edition to the high tea, which also included a variety of tea sandwiches and tea from Mariage Freres in Paris. 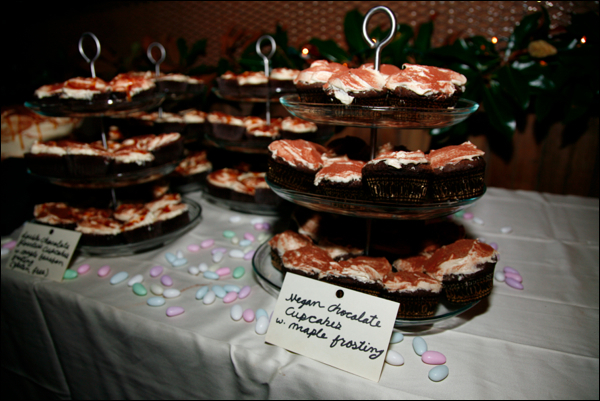 These cakes are also addictive, so the cupcake size can either help or prevent you from over indulgence. What do you like to serve for your tea parties? Never hosted a tea party? Why not? 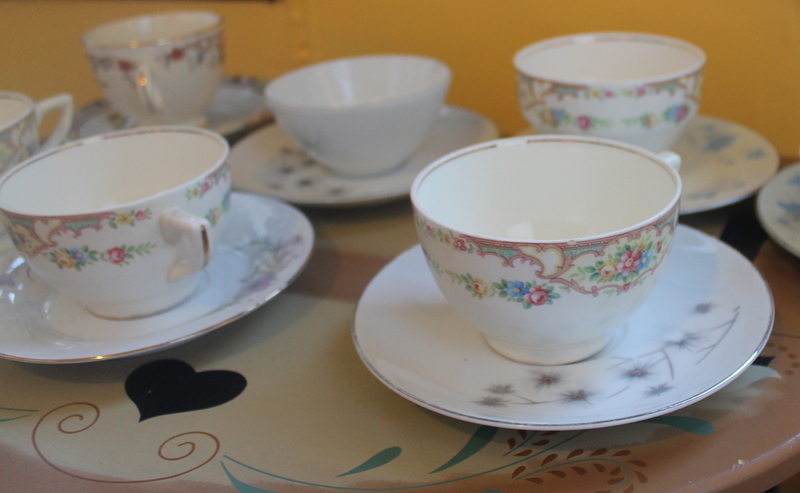 Get mismatched vintage tea cups, saucers, and napkins at thrift stores and invite guests to bring them home as a party favor. 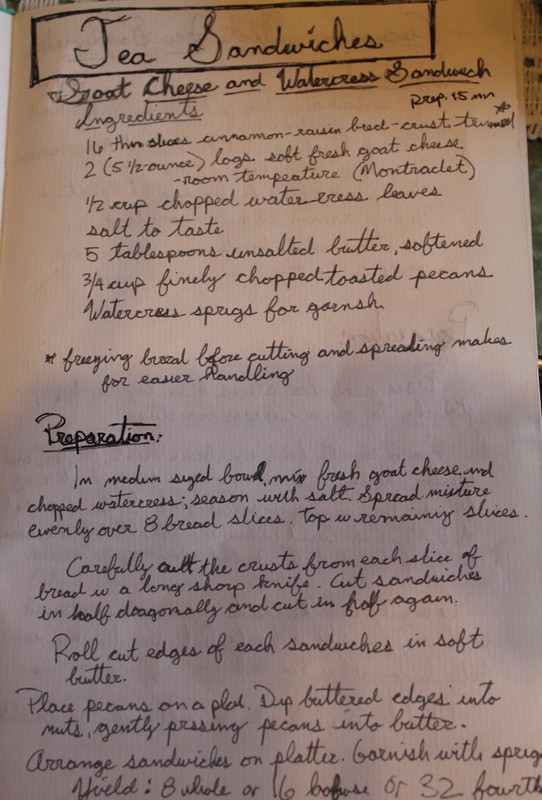 Create a recipe book or zine for the person the party is celebrating. Try a specialty that you’ve never had before, or a tea that you love and share a story about that tea. Tea parties need not be fusty, they can be pretty special, huh? Vintage cups and saucers thrifed for the occasion in Pittsburgh! I don’t know how it happened, but this week we are hosting our second, and what looks to be annual, super bowl party. The fridge is full of ingredients and our kitchen will be working overtime this weekend to produce nacho fixins, middle eastern dips, and (perhaps most importantly) five different kinds of hot sauce for baked wings! If you want a sneak preview, I invite you to review SMH’s excellent post from last year on face melting hot sauces, baking wings, and sports food tradition. No matter who wins this year, we know the real victor will be the hot wings. Happy new year everyone! Of course we celebrated in true 2 Cooks style with a big party with lots of food. 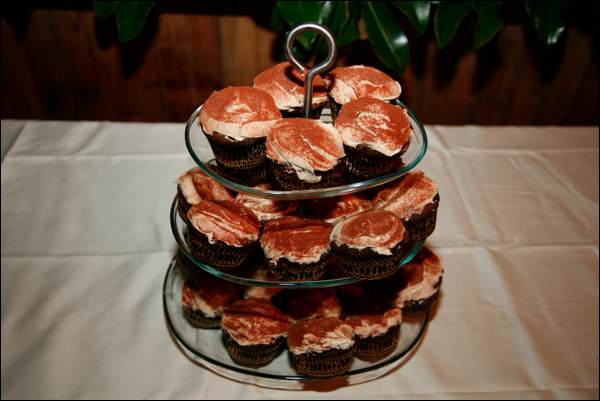 Since I made Billey and Lydia’s wedding cake this fall I have developed a new baking obsession: custom cupcakes. 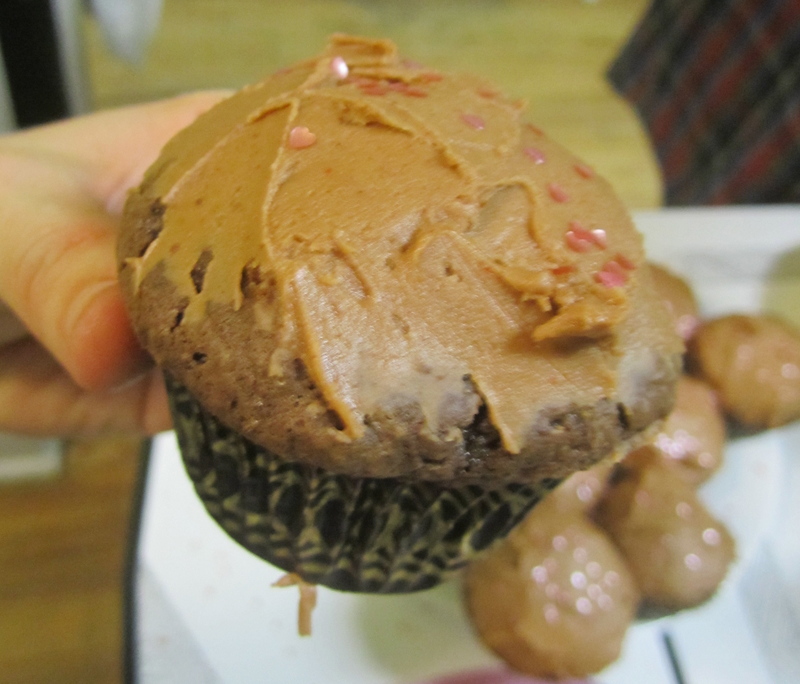 For new years I made peanut butter cupcakes with chocolate bourbon frosting, delicious! I think I really got into the custom cupcake mood because a few weeks prior, in early December, I got word that my friend S.G. was having a potluck for her 30th birthday a custom cake was the first thing that came to mind. I don’t know about all of you, but I never want to make my own birthday cake. 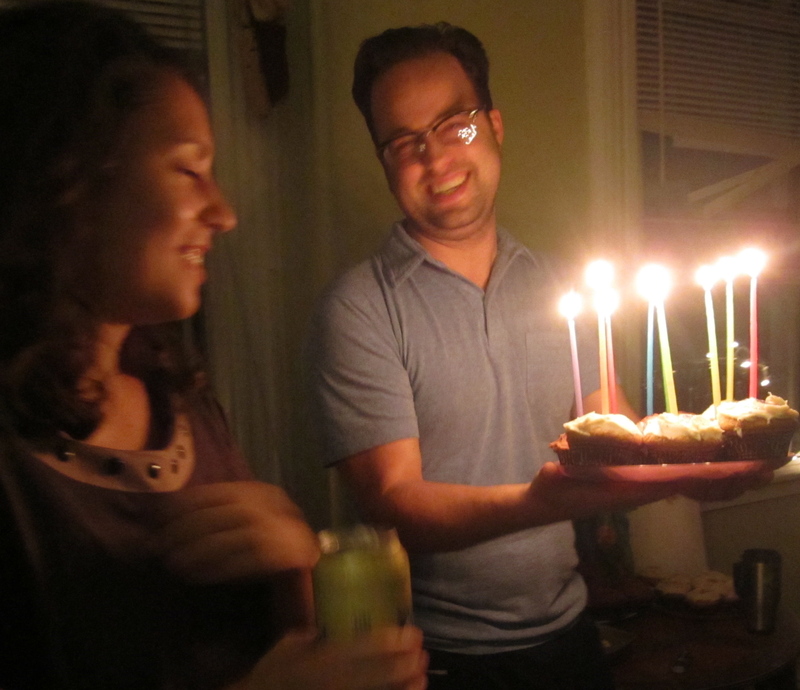 If someone doesn’t offer to bring a cake to the annual birthday potluck I co-host with my best friend, we don’t have a cake. It may sound like we are being divas, but I feel like a cake is an important gift and more effort than I want to go through on my birthday. 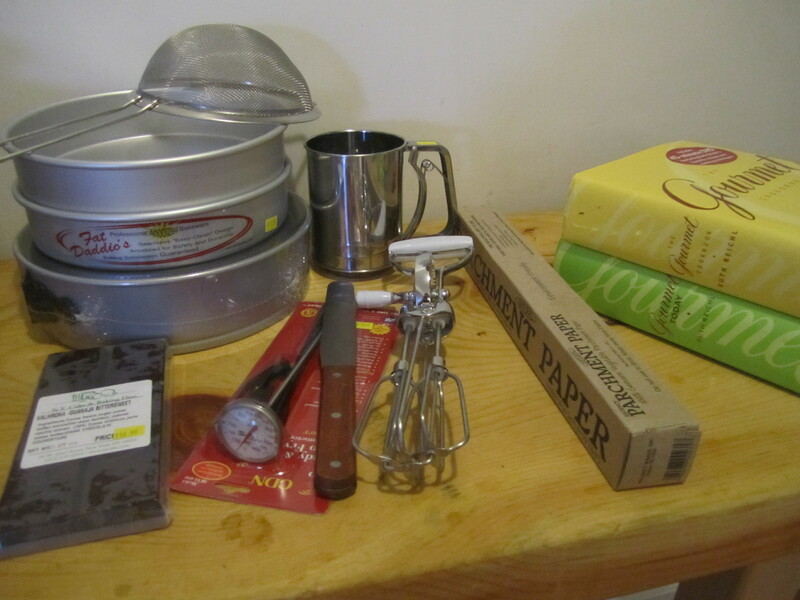 S.G. gave me a clear cake wishlist: chocolate, chili, lavender, and lemon. Taken together in one cake these ingredients sound less than harmonious. So I asked her, “Would you be disappointed if you had cupcakes? 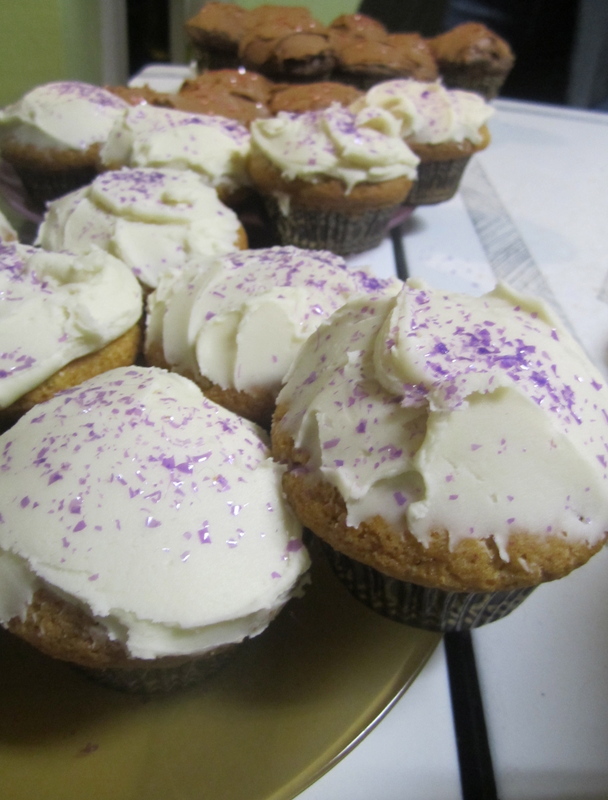 Perhaps two different kinds?” Fortunately, she said she would not be disappointed by cupcakes. Which leaves me to wonder, am I the only person in the world who is worried someone will be disappointed by the offer of birthday cupcakes? The first idea sounded straightforward enough: chocolate with chilies, which is now classic foodie combination. 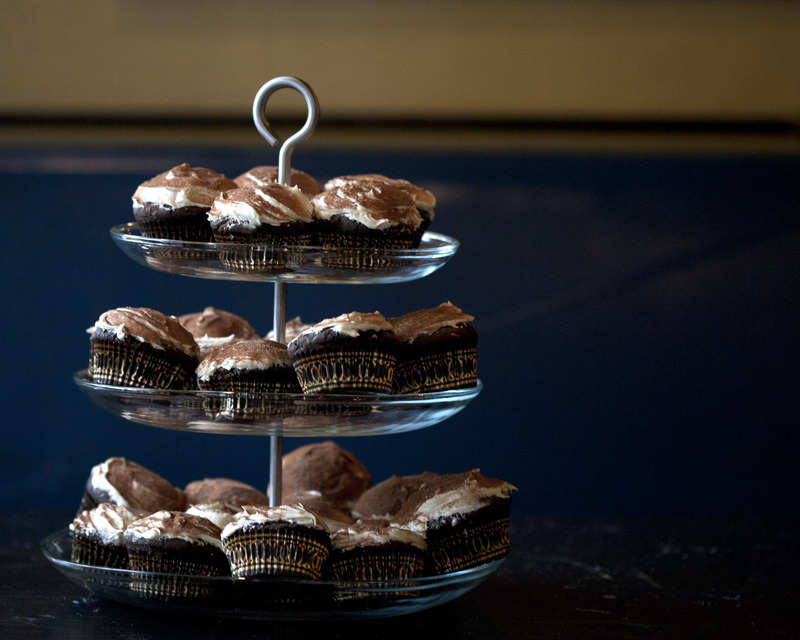 After some internet searching an idea appeared: how about chocolate, cinnamon and chilies? Like a Mexican hot chocolate? The second idea I had to let steep a little bit longer. In searching for lemon cake recipes in cookbooks and online I realized how difficult it is to come across a good, classic lemon cake recipe. The kind you may have made with your Mom when you were a kid. Of course, fortunately for me my Mom still has the Betty Crocker cookbook we used to make cakes when I was a kid, but that book is not here in NYC. So I shifted by focus to the lavender. 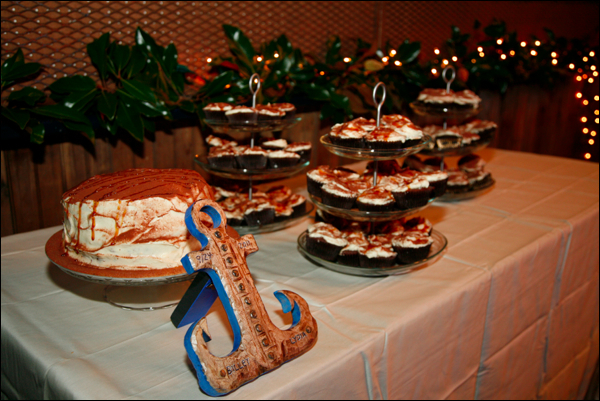 I thought it’s subtle flavor would get lost in the cake, so focused on the frosting. 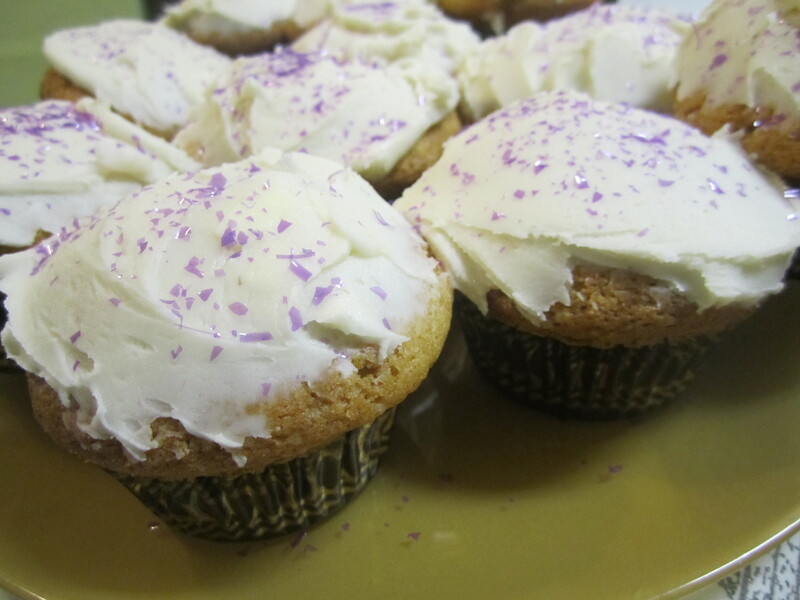 Fortunately, I found many ideas for lavender frosting online and also got a great idea for the cupcakes: how about lemon cake made with creme fraiche with lavender frosting? It’s like Provence in a cake! 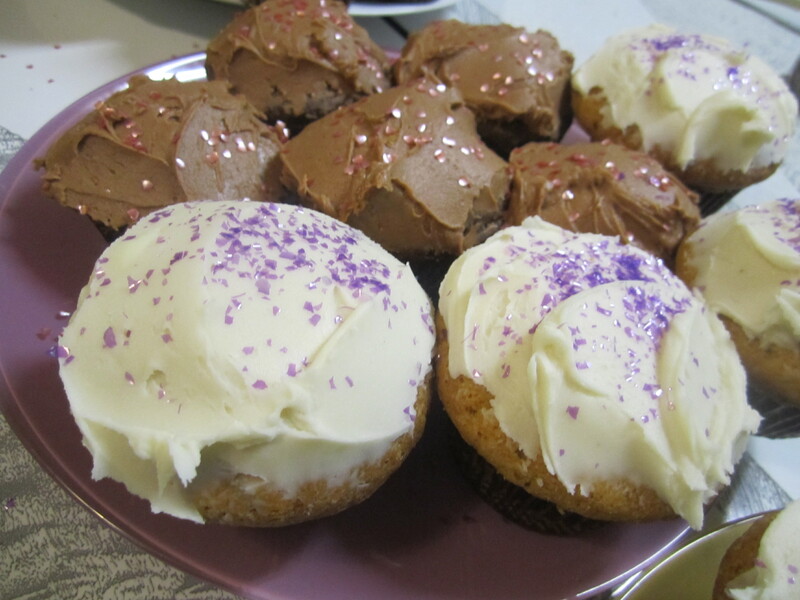 These cupcakes were also an excuse to what is quickly becoming my favorite store: NY Cake and Baking Company to pick up some more Valrhona chocolate and edible glitter. 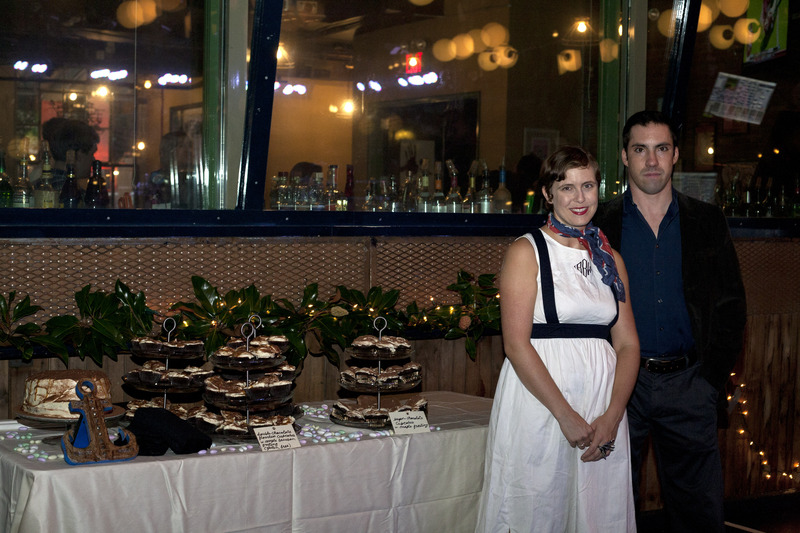 At the party the cupcakes were a clear success and the extras also got a warm reception at work the next day. 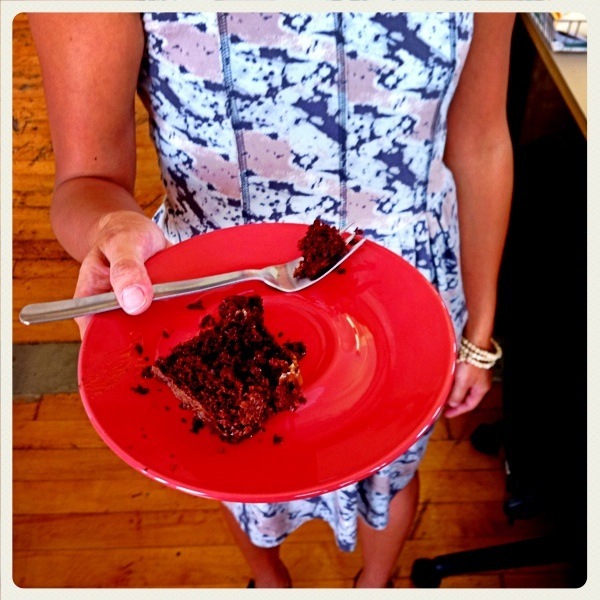 As as you know, my co-workers are excellent cake testers. I altered a traditional lemon cake recipe I found on Epicurious, but used a half cup of creme fraiche instead of milk and added the zest of one lemon as well. I was inspired by a recipe on Tasty Kitchen, though I omitted the food coloring and had dried lavender flowers without the stems, so I just used about 3 tablespoons of the dried flowers. 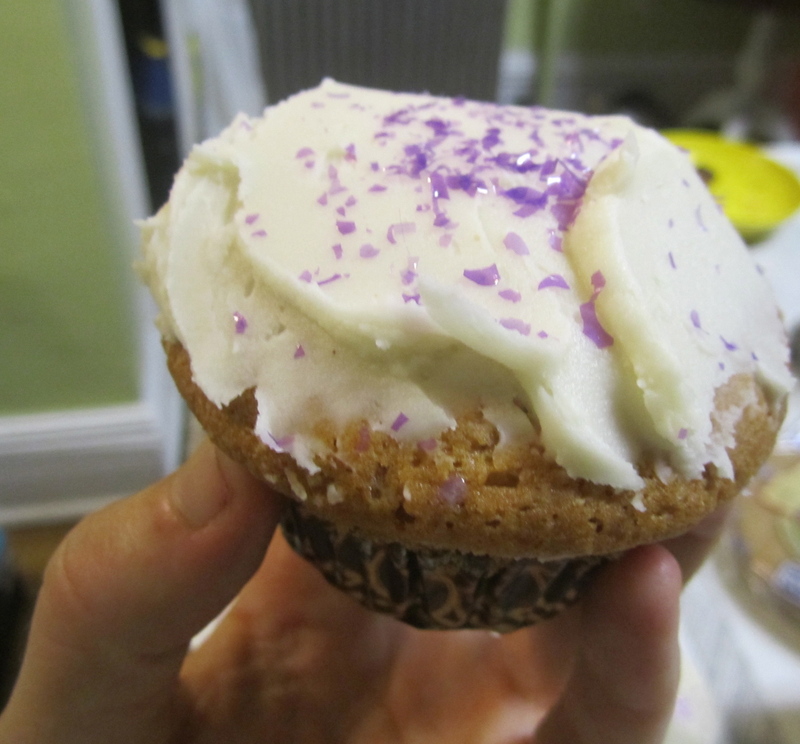 And yes, that's lavender edible glitter! 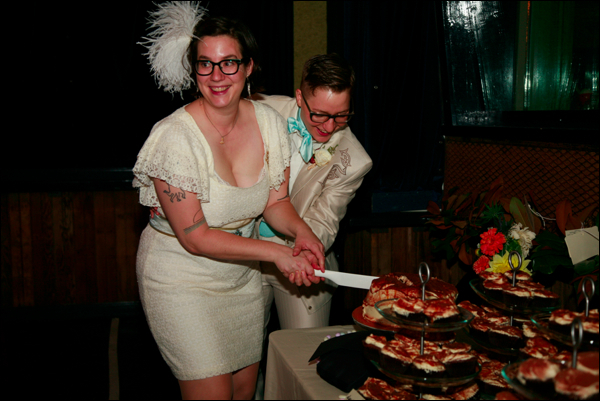 I was a little crunched for time, so I used the sour cream chocolate cake recipe I used for Lydia and Billey’s wedding cake, since I knew it would stand up to exacting taste tests. I simply added 2 generous teaspoons of cinnamon to it. 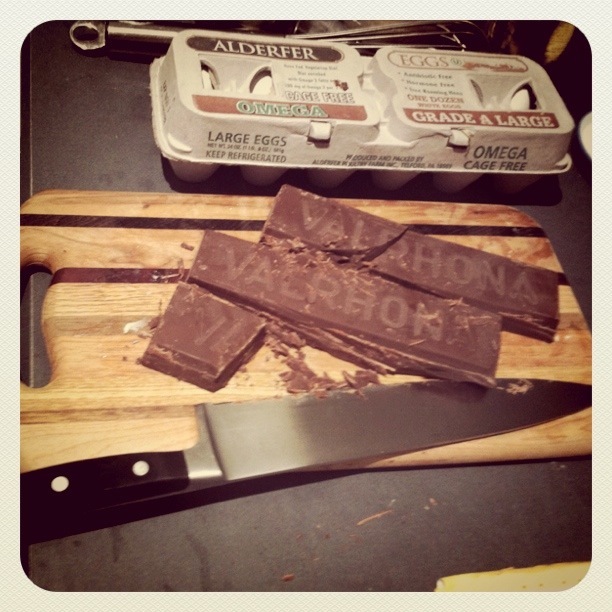 In a sauce pan over a medium-low flame melt the chocolate, stirring with a rubber spatula. Once the chocolate is melted, stir in the milk until combined. Let cool. In a food processor or with an electric mixer cream the sugar and butter and then add in the chocolate milk, vanilla, cinnamon, chili powder and cayenne pepper. Taste and adjust spices if necessary. 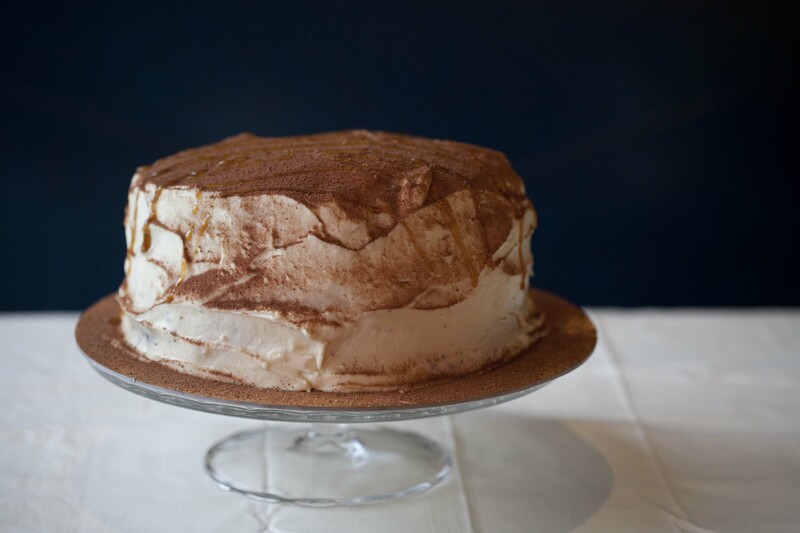 If the frosting is too liquid add more confectioners sugar. 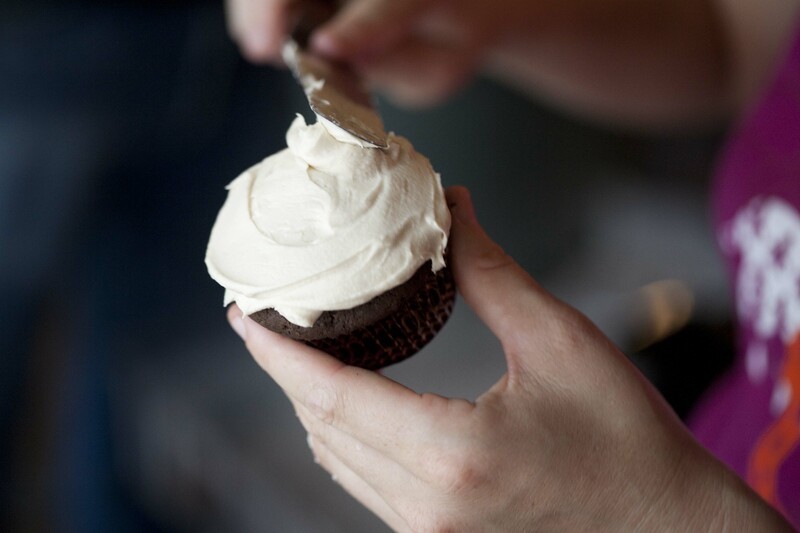 Let your cupcakes cool before you frost and enjoy! 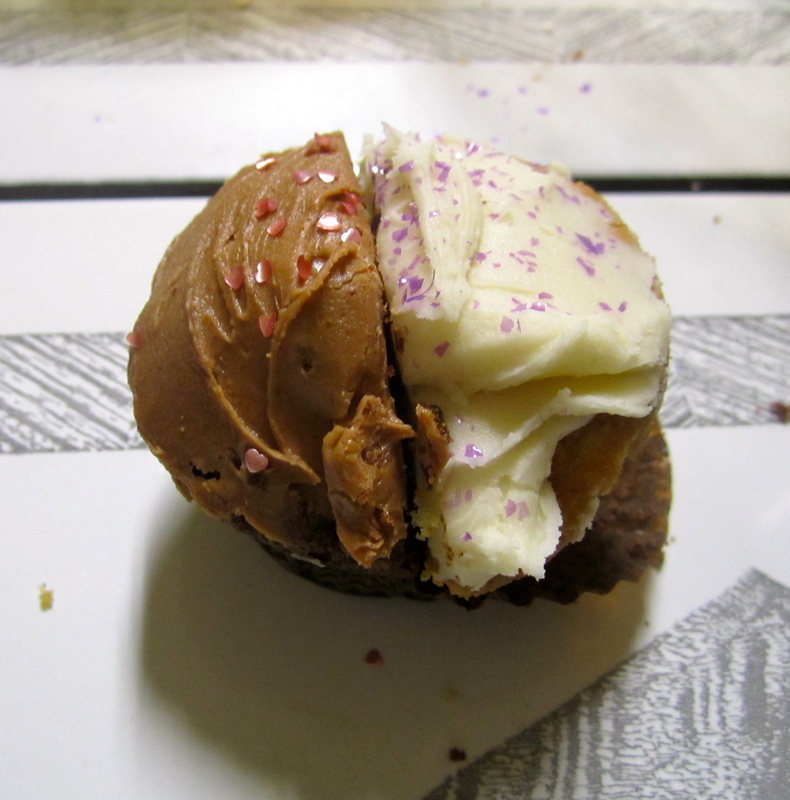 I’d love to know, what are some of your favorite cupcake/frosting flavor combinations? 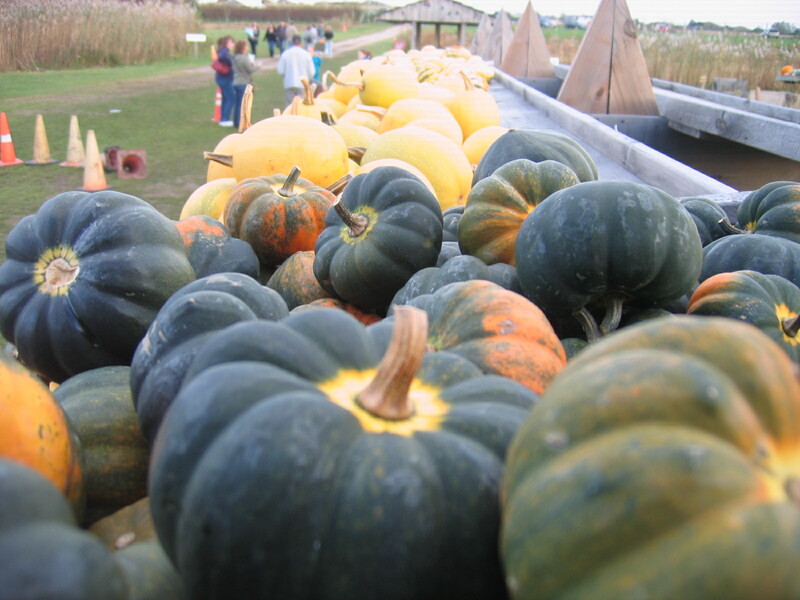 Squash season is here and it’s hard to resist these pretty orbs in all their bold orange and yellow splendor. 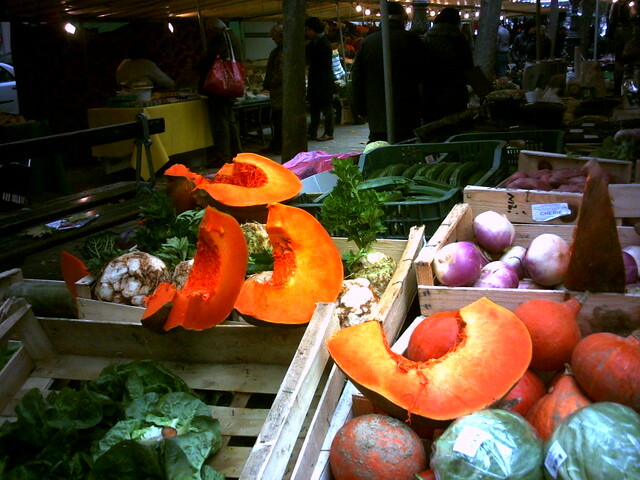 However, they can be intimidating to cook and definitely require a sharp knife to cut through their tough outer layer. I decided to try squash a few different ways this fall, and here are three ways to use those squashes that might still be hanging around from your CSA or that you just couldn’t resist from the farmers market, but are not sure what to do with: soup, salad, and bread. This fall I received another giant wedge of wax pumpkin and decided to revisit my wax pumpkin soup recipe from last fall. However, I altered it slightly, and left out the sage and pomegranate seeds instead added cumin, coriander and a dash of curry powder and served with with a drizzle of Siracha hot sauce and creme fraiche. I loved the spicy flavor of the sauce and the velvety texture the creme fraiche adds. You could really make this soup with any orange fleshed squash: butternut, acorn, etc. 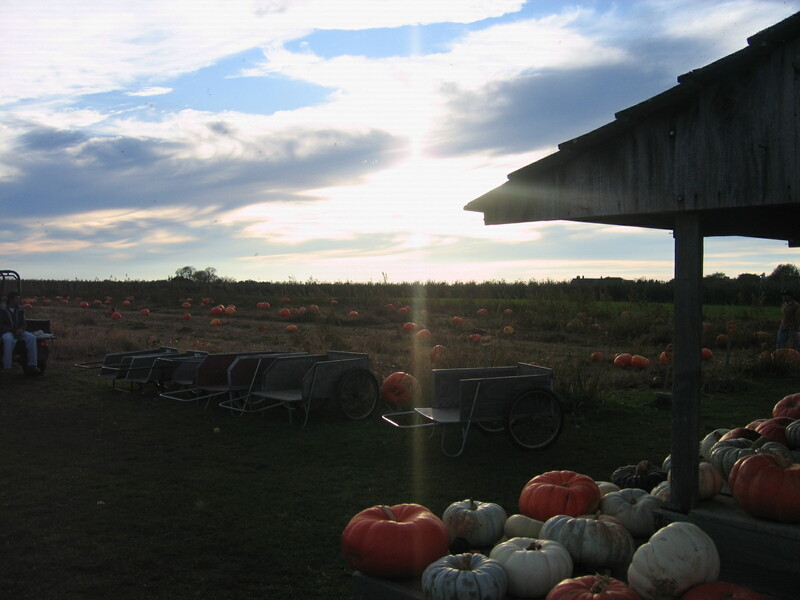 I also had some acorn squash that was sitting around looking lonely. Unsure of exactly what to do with it I finally decided to roast it and add it to a salad to take to Laura’s creative lady potluck the other Sunday. On a bed of arugula and accented with goat cheese and roasted pumpkin seeds it works as both a side or a full meal. Preheat the oven to 400F. Halve the acorn squash, scoop out the seeds, peel and cube. Lay the squash on a metal cookie sheet or baking pan and toss with olive oil, salt and pepper. Roast for about 25 minutes, stirring once, until pierced easily with a fork. Remove from oven and pan onto a plate or bowl and let cool. Wash and dry arugula. Slice onion into thin half moon slivers. Toss arugula, squash and onion in a salad bowl, crumble goat cheese over the top and add the pumpkin seeds. Toss with your favorite vinaigrette dressing. Enjoy! I’ll admit. I got a craving for pumpkin bread when I saw a recipe for it in the Weight Watchers weekly. 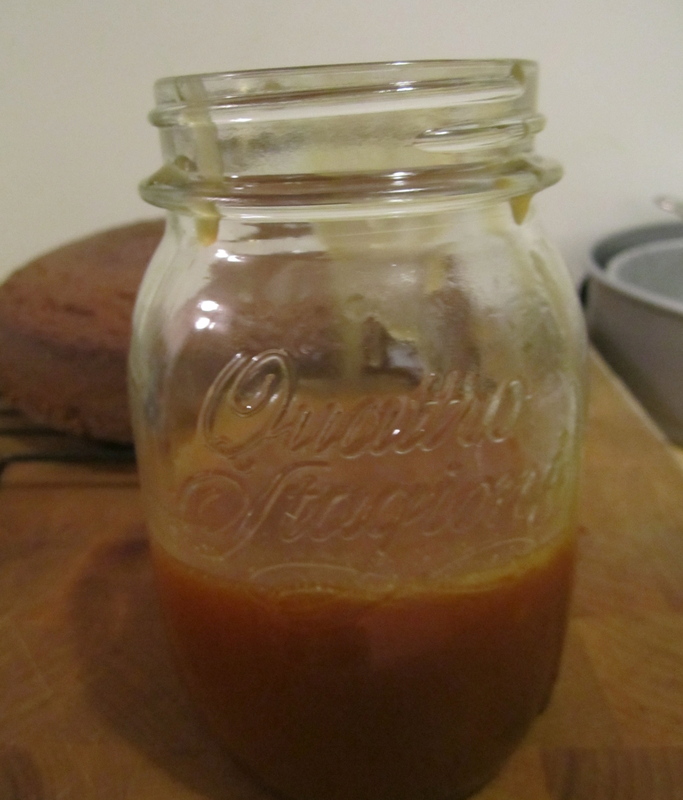 I decided to make my own dairy-free pumpkin bread, but I cheated a little and used organic canned pumpkin (hey, it was only $1.18 a can, so easy for the busy professional!). You could roast a pumpkin and puree the flesh if you are opposed to canned pumpkin for this recipe. Preheat oven to 350F. In a food processor or using an electric mixer cream together sugar and margarine/butter. Mix in the egg. Add the pumpkin puree and mix. Gently mix in the flour 1/2 cup at a time and then add the baking powder, baking soda, and salt. Gently mix in the orange juice, orange zest and spices. Pour batter into a greased 9×9 baking pan or a loaf pan. Bake for 30 minutes and golden brown on top or until a toothpick inserted comes out clean. Enjoy with tea or for dessert! Enjoy squash season. 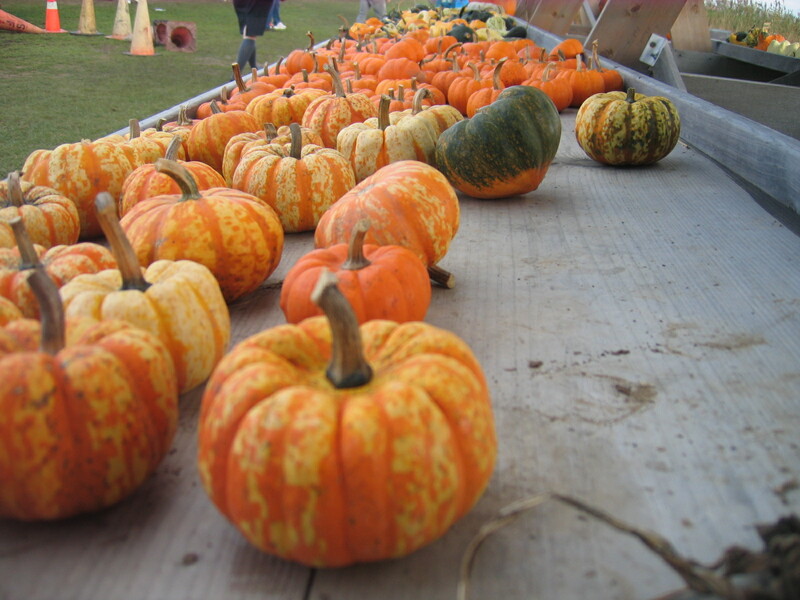 What are your favorite kinds of squash? 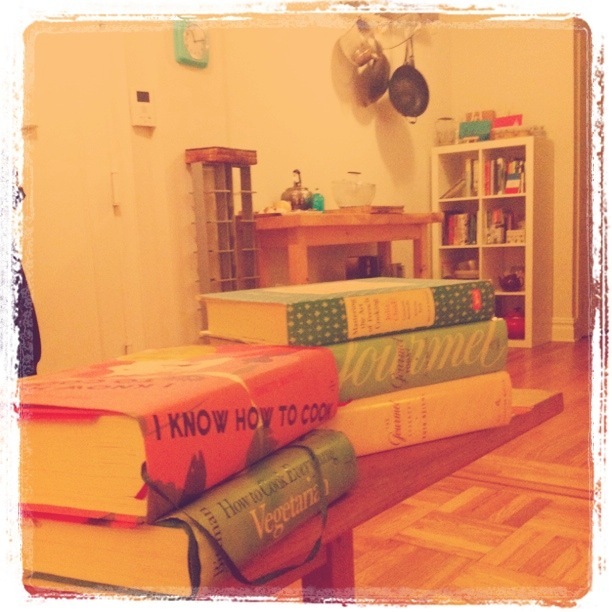 And your favorite squash recipes? 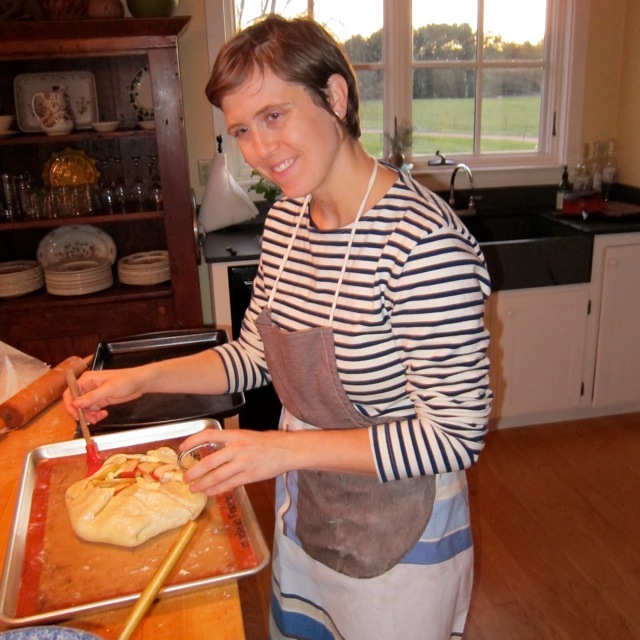 Art + Food + Brew Your Own Beer Workshop + Conversation = Eat Art! 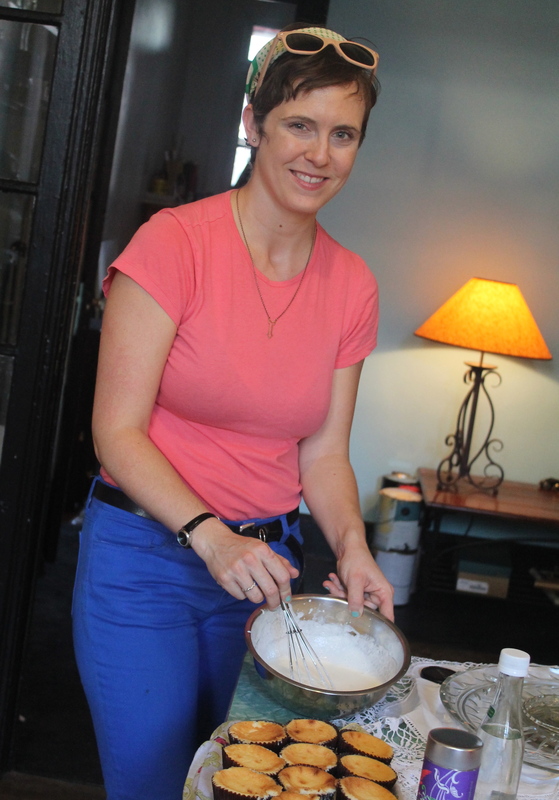 Here at 2 Cooks we have lots of interests, but many of them fall under the major categories of: art, eating and drinking, and connecting with people through meaningful conversation. Driven by these interests Tracy Candido and I have put together the next installment of our new, socially-engaged happening EAT ART on Sunday, November 20th to bring them all together. We cordially invite you to come hang out with at an event all about beer: drinking, brewing, its history and as art. At Bitter & Esters, a new home brew shop in Prospect Heights in Brooklyn, we’ll learn all about beer from Bitter & Esters’ main dude, co-owner John LaPolla, and Colorado Springs-based artist Eric Steen, who uses beer as a medium to explore the social aspects of community drinking. Sip on a Heather Ale designed by Eric and learn how to brew some yourself while talking about home beer brewing, beer history, ingredients like hops, yeast and special ingredients like heather, and beer styles. Eric will talk about his preoccupation with art and beer, as well as his current project, “Brew Pub” at the 2011 Performa festival and previous projects such as “Art & Beer” at the Portland Art Museum and “Pub School” at the Glasgow International Festival of Visual Art. Then take a break from obsessing about beer long enough to chomp on some tasty fall-inspired snacks made by the EAT ART team. Join us! Add some more beer and art to your life. Tickets are $65 and include pint of artist designed Heather Ale, beer brewing and history workshop, artist talk with Eric Steen and snacks made by the EAT ART team. You can purchase tickets here. Hope you will come raise a glass (of beer you learned to make) with us! Sift flour, sugar and salt into a bowl. Cut butter into 1 TBS sized chunks and work into the flour with your hands until it forms a crumbly butter/flour mixture, like very coarse sand. Mix in the water a tablespoon at a time until the dough forms a ball. If it’s too wet add a little more flour. Usually I make my pie crust in the food processor, but it was in the dishwasher, so I made my crust my hand and honestly it tasted so much better. It was not overworked and did not take much long, and there was less implements to clean up. 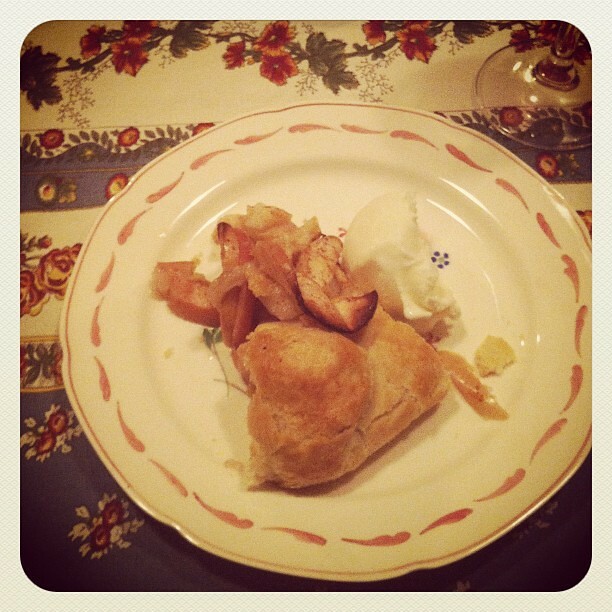 Making the apple galette in a Maine kitchen! Preheat oven to 400 degrees. On a piece of parchment paper or a silicone mat roll out the dough to be about 15 inches in diameter. 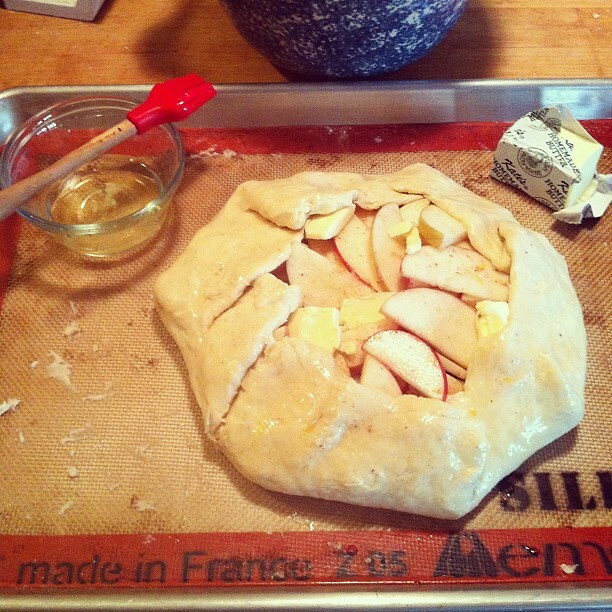 Arrange the apples in the center of the dough and leave a 2 inch border. Place four small dabs of butter about a half tablespoon each on the apples. Gentle fold up the edge of the galette over the apples. Slide the parchment paper or mat onto a baking sheet. Brush the crust with egg white. 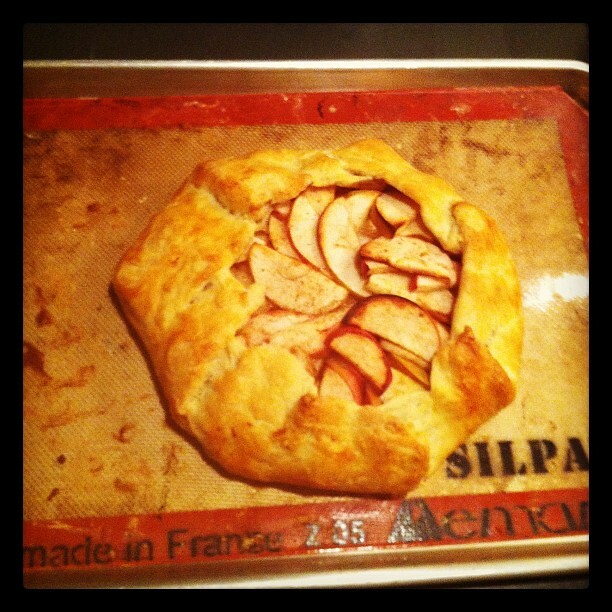 Gently cover the galette with tin foil and bake for 20 minutes. Remove the tin foil and bake for another 25 to 30 minutes. 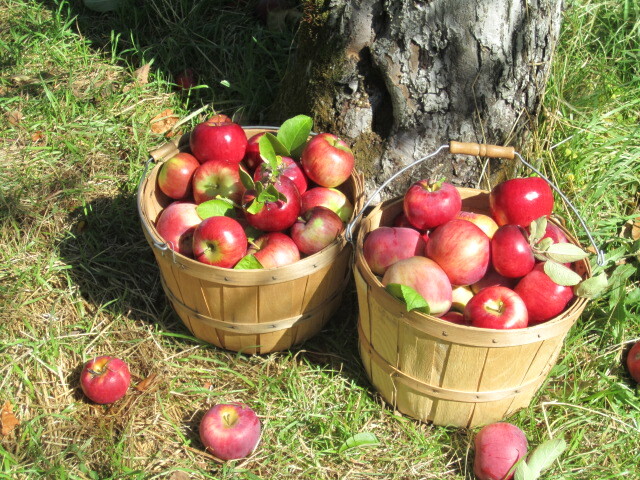 When the crust is golden brown and the apples below the top layer are bubbling it’s ready. Cool for about 20 minutes and serve with a little vanilla frozen custard. If you are in Maine you should have Hodgman’s Frozen Custard from New Glouster because you stocked your freezer during the summer!